There are many Guild Starfires, but this one is mine. Well, this is one of several of mine, but this one is special to me because it was the first Guild I bought when I got back into playing guitar around 2008 or so. I bought it sight unseen for $1200 after someone at Norm’s Rare Guitars gave me an in-hand description of it over the phone. It was mint and I had to have it. This guitar ruined me for other guitars in a number or ways and though it is almost perfect for me in every way, it is not without its faults. Naturally I will outline whatever faults I feel this guitar has in excruciating detail right along side my gushing praise for all of the guitar’s many merits. As someone who’s owned far too many Guilds, what could possibly make this one so great? 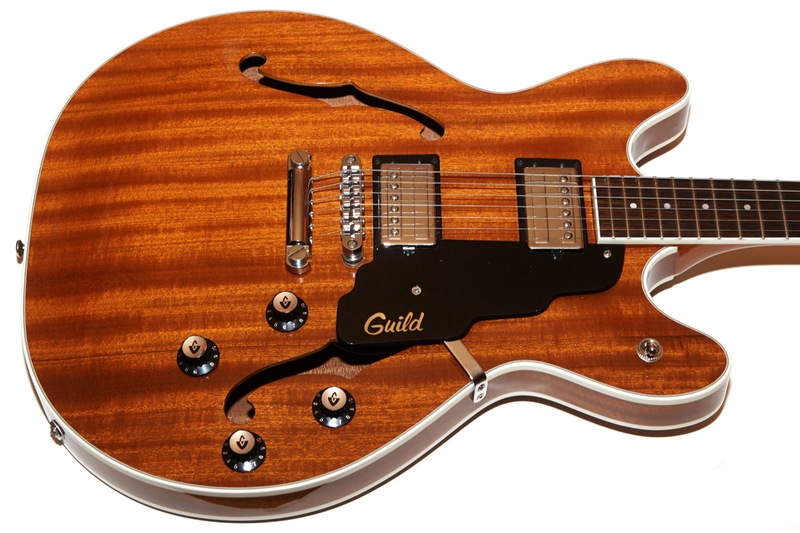 As already stated, I’ve owned a lot of Guild Starfires. Of them all there was only one that came close to this one and it was a seemingly rare 1994 transparent red beauty with gold hardware and real vintage HB1 pickups. Why did I sell that one? Because I’m an idiot. Also, at the time I had a rule about keeping two of the same type of guitar and it was in direct competition with the 2000 Starfire that is the subject of this review. Regardless, it’s gone, hopefully in the hands of someone who appreciates it’s fine tones and crushing good looks. I first fell in love with Guild because the local music store in the town where I grew up sold them. 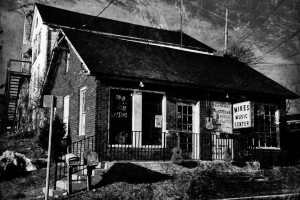 Mike’s Music in Stirling, NJ was still in business until 2016 when Mike passed away and I imagine that his little shop will likely be torn down in favor of some new pre-fab super-store or something terrible of similar ilk. That little store is where I saw my first Guild and where, after saving up my money from my first job, went in and bought the then brand new 1979 Guild S300A-D that was hanging on the wall. That would have been roughly 1980 and I’ve loved them ever since. My friend Rich learned to play from Mike in that little store while we were in high school. 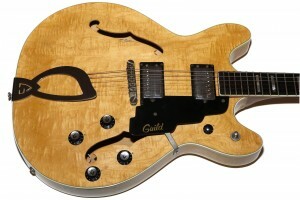 He also bought a Guild from Mike, though his was a very different guitar: a 1979 Guild Starfire IV in natural blonde maple. Rich’s Guild was a semi-hollow beauty with a harp tailpiece and just seemed to exude an air of style and sophistication that was missing from my much more modern-looking S300A-D. With its harp tailpiece, block inlays, larger body, master volume, and Guild HB1 pickups, Rich could dazzle listeners with his jazz and rock chops better than I ever could. Of course, that likely had more to do with his abilities and time spent practicing, but in my teenage mind, it was all about the guitar. You may notice that I seem to switch between Starfire 4 and IV, and there is a reason that I do. The original Starfire IVs used the roman numeral on the truss rod cover while the reissues (this 2000 is technically a reissue) use the Arabic numeral 4. Note that the sticker inside the f-hole still says Starfire-IV on this guitar and that’s the name of the model in the price guide and catalogs, so it’s all just pedantic nonsense that I made up in my head. Time passed, high school ended, and we all went our separate ways. I played for years, then gave up the guitar almost entirely for a time wherein I made the foolish decision to sell my Guild. At the age of about 40 I decided to get back into the game and started playing (and buying) again. After a couple of lesser purchases, I decided to buy the 2000 Guild Starfire 4 that is the subject of this tale. After buying the 2000 Starfire, I started down a path that resulted in me owning many Guilds and a webpage devoted to writing about them. I bought a 1973 blonde Starfire IV just like Rich had in high school, only to discover that I really didn’t like the neck because it was so small. I bought Starfires from the ’70s, ’90s, and the 2000s in a quest to find the perfect guitar, never quite realizing that I had it already in that 2000 Starfire sitting in its case in the closet. After owning literally 20+ other Starfires, I realized that I was comparing them all to that first one, and with the exception of the red one that I foolishly let go, none of them really compared. 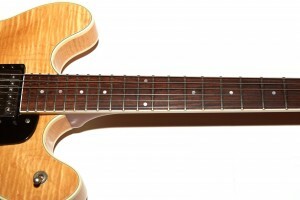 As a result, I figured it was high time I wrote a review of that great guitar. I believe the finish on this guitar to be lacquer. It’s faded since I’ve owned it and where it used to be bright blonde maple, it now has a sort of patina to it which would probably be more accurately described as an aged finish. The finish is, of course, expertly sprayed and there are no issues anywhere on the guitar, and that’s good because the flame on this guitar is supurb, as it is on every Starfire I’ve seen from this era of Guilds. Where the 1970’s Starfires tended to have more plain tops, the tops on these babies is all about the flame. The flame can be tough to catch in photographs because it reacts very strongly to light angle and the flash can easily wash it away. Additionally the color of the guitar can be tough to accurately represent because it’s so striking in person and that doesn’t always come across in the photos. 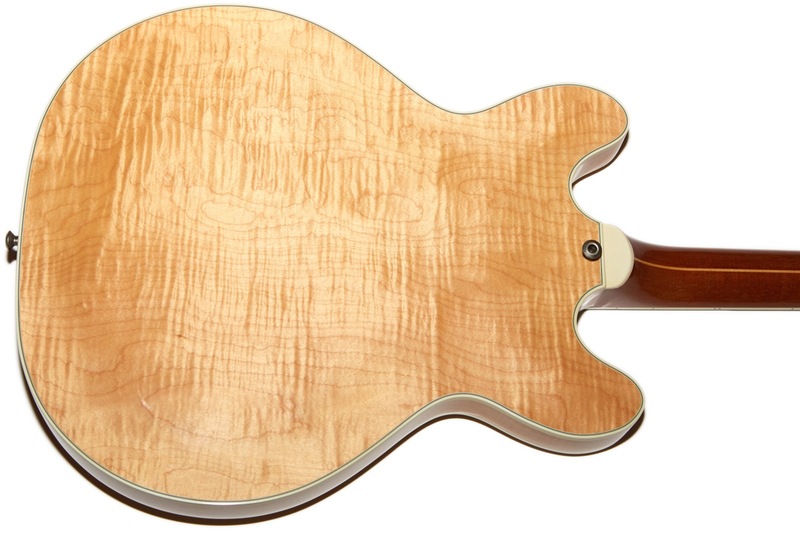 Look at the picture in this Finish section compared with the first picture in the next section and you’ll see what I mean about the guitar’s color. The biggest thing that I love about this guitar is the neck. The fretboard is bound rosewood and it is an absolutely stunning piece of wood. I oil my fretboards with bore oil about twice a year (and before I take pictures) and the wood just glows with a deep dark red with black veins that just screams “I’m jealous of your fretboard.” The binding isn’t anything special and the side fret markers are small dots. As of this writing the guitar is 16 years old and there are no signs of the binding splitting or rotting. The fretboard markers are dots, likely comprised of either mother of pearl (MOP) or some sort of MOP-like substance. I’m less picky about dot markers than I am about blocks because it’s much more obvious when block inlays are installed poorly. Regardless, these markers look great. 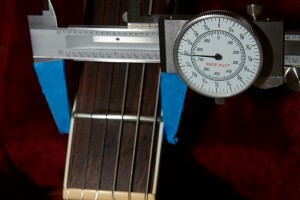 The fretboard measures a 12″ radius with my gauges, and it is a perfect match. Sometimes it can be hard to really zero in on what the radius is, especially with flatter fretboards, but this one was quite obviously 12″. That could be because of how wide the board is or it could be that whoever made it was really on the A-game that day. Either way, the fretboard is fabulous. I measure the frets on this guitar at about 1/32″ (.03″) high by 3/32″ (.10″) wide which makes them roughly 6130 or medium jumbo frets. The feel higher to me than my vintage Guilds, though they’re certainly not the super jumbos I’ve seen on some shredders. Where this guitar blows me away, though, is the width of the neck. 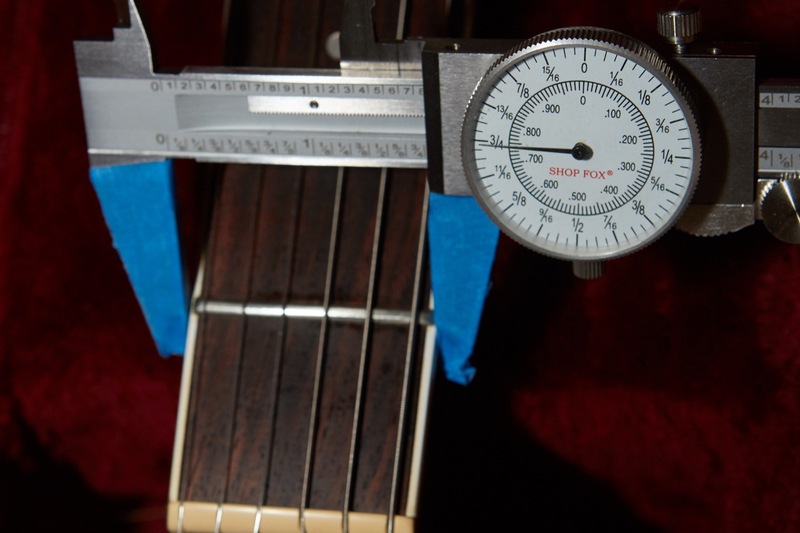 The nut width is actually wider than 1 11/16″ at the nut, and in fact measures a solid 1 3/4″ wide at the first fret. The neck is also nice and chunky and is possibly my favorite neck ever. It’s not stupidly fat like a D-shapped Gibson R8 (Historic 1958 Les Paul Reissue), but rather seems to be the perfect C-shape with a nice depth to match the width of the board. I just love it but I imagine if someone loved the thin necks on vintage Guilds from the ’70s that they would really dislike this neck as it feels positively huge by comparison. This guitar (along with a Jackson SL2H I’ve had for about as long) is the reason that I’ve grown to dislike tiny necks. And yes, the calipers have been properly zeroed to account for the addition of the painter’s tape. The neck is three-piece mahogany on this guitar which is another cool feature since the body is maple. On X-170s and X-500s, for example, I’ve never seen anything other than a maple neck on a maple guitar, but I think the big ol’ mahogany neck on this maple-bodied guitar imparts a very nice balanced tone where a maple neck might have made the guitar too bright. The neck is so wide that after playing my 1 5/8″ necked Guilds I feel like this neck is almost too big. Almost. Then, after playing it for a few minutes I’m right back home and loving the extra space all over again. Of course, that only leads to me being frustrated once more when I go back to the older Guilds, but then I realize I’m sitting here complaining about my many vintage Guild guitars and remind myself to shut the hell up and remember the times when I had only one guitar for 20 years and almost sold it repeatedly to pay the rent. This is an American-made Guild guitar from the Westerly Rhode Island plant. Every Westerly Guild I’ve ever owned has been a phenomenal guitar, and guess what? This is a phenomenal guitar. The build quality is fantastic. The finish is beautiful. The attention to detail is second to none. There are no gaps, no visible seems, and no problems anywhere. This guitar is made from laminate (like a Gibson ES-335) and weighs 8 lbs 10 oz, so it’s a bit heavy, likely due to the large center block running down the middle, but the weight is pretty well distributed so it doesn’t feel like a boat anchor around your neck. OK, so my gushing about the Westerly plant aside, vintage Guilds can and often do have problems like binding rot and headstock veneer shrinkage, but those are problems I usually see on Guilds from the ’70s. These late-’90s to early-’00s Guilds are impeccably well made in my experience. Hell, even after Fender moved Guild production to Corona the quality was superb. My one and only complaint with this guitar was the pickups. The stock pickups in this guitar were Fender HB1s, and to be honest, I was not a fan. I find them to be quite uninspiring and devoid of all the chime and articulation of the original Guild HB1s. This is really a magnificent guitar, and to have such lackluster pickups in it was just a crime, pure and simple. Through the course of my newfound interest in guitar I have managed to befriend a number of builders including some custom pickup winders. Jim Wagner of WCR pickups (now Jim Wagner Pickups) agreed to rewind the Fender HB1 pickups for me as a favor because I’m awesome. Why not just replace the pickups with something off the shelf? Well, to me, part of what makes a Guild guitar look like a Guild guitar are the double-hump HB1 covers. Since this guitar was made in the Fender era, it uses Fender pickups which are the modern standard pickup size. That means I couldn’t put in vintage HB1s, and since there are no double-hump pickups that fit into the routes on this guitar, my only choice was to have these rewound if I wanted to keep the covers. I can’t comment too much on the original electronics because I swapped them out for an RS Electronics kit when I replaced the pickups. There was nothing wrong with the stock electronics and if this guitar had come with better pickups the stock parts would still be in there. At the time I did the swap, though, I was big into replacing electronics and so I decided to do it on this guitar which is why this guitar has a $100 electronics “upgrade” that it didn’t need. It works great, though, so no problems there. The hardware is all rock solid and is pretty much the same as other Guilds from this time period. 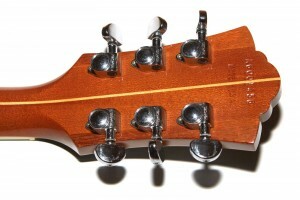 The tuners are Grovers that work great and the knobs are typical Guild plastic knobs. 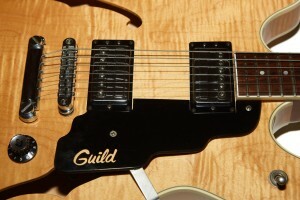 The pick guard is also typical of this era of Guilds in that it has the stair step design with the Guild scrip logo on it. I’m generally against logos anywhere but the headstock, but on this guitar with it’s slightly aged finish, the logo actually complements the color of the guitar very well so I don’t find it to be obnoxious. 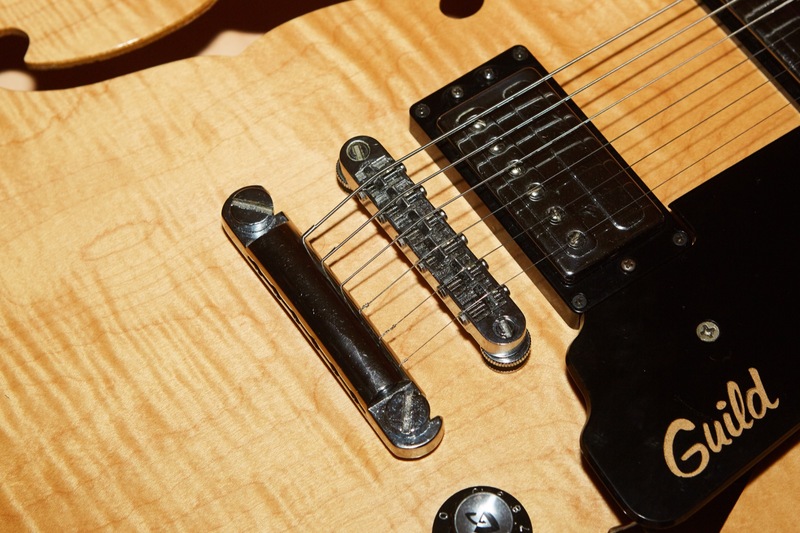 I like the pick guards on these late-model Starfires because they wrap around the pickup rings unlike the pick guards from the ’70s that sit on top of the rings. With the older style the pick guard is in my way constantly when I play and it drives me crazy. As a result, I almost always remove them. With the more modern guards, they’re much more unobtrusive while playing so I end up leaving them on. I tend to like the look of a big semi-hollow with a guard on it, so this one has stayed since I bought it. The switch-tip was lost long before I bought it and my original pictures all show a black plastic tip. I finally scored a reasonable replacement to the original Guild metal tip which had been on the guitar for a few years now. 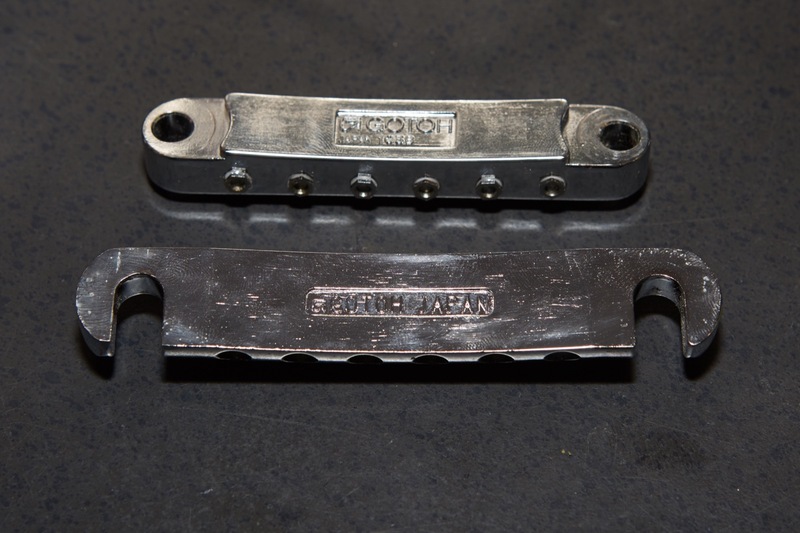 The bridge and tailpiece are both Gotoh items and are clearly branded as such on the bottom. The tailpiece is designed so that it can be used as a traditional stop tail while also having slight indentations on the front that would allow it to be used as a wrap-around bridge if you like the change in string tension that setup brings. Both the bridge and tailpiece slide right off so if you buy one of these new, don’t forget to remove them when you pull the strings off or they’ll fall on the floor when you flip the guitar over to admire the back. Not that that’s ever happened to me. Repeatedly. As is likely evident by now, I love this guitar even more than I love most of the rest of my Guilds, but as great as it feels while playing, what matters in the end is how it sounds. Remember, I’ve had the pickups rewound on this guitar and the electronics have been swapped out so these sound samples may not be representative of what you’d get if you bought one of these with a stock configuration but I do feel that it sounds the way the guitar should sound with the pickups it deserves. 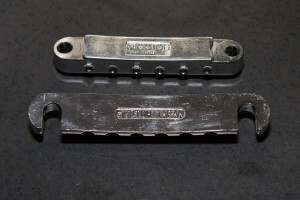 Every sound sample cycles from the neck pickup, to both, to the bridge pickup. For these recordings I used my normal Axe-FX Ultra setup through the QSC K12 speaker recorded into my trusty Olympus LS-10. As usual, most of the recordings are through the Tiny Tweed patch, though I also added a recording through the JCM-800 and one through a setting called Backline. The Backline patch is probably my favorite of all the patches on the Axe-FX, likely because I spent a fair amount of my 20s obsessing over bands that had huge rows of powerful backline guitar amps, not to mention long hair, killer riffs, and plenty of spandex. If I had to be critical of the sound recordings, I’d say that the bridge pickup can be a bit harsh, though I think I could probably back that pickup away from the strings a bit to lower its output and probably clean that up if I really wanted to. This guitar is all about the neck and middle positions for me, though, and if I’m using the bridge pickup it’s for leads where I might want that extra bite. Honestly, with all the other reviews that I’ve been doing lately the guitar has sat in its case for months. All I did was clean it up and restring it without any thoughts to things like pickup height, so it’s likely that any harshness heard in the bridge pickup is entirely my fault. Honestly, though, I like the way they bite when played with distortion so I’m not changing a thing. There’s a reason this is one of my favorite guitars. Actually there are lots of reasons, but the main one is how easy it is to play. With its wide chunky neck it just feels so right in my hands that I can’t put it down when I pick it up. Between the wide, hefty neck and the nicely designed pick guard, I really feel like this is about the pinnacle of Guild’s semi-hollow guitar design. 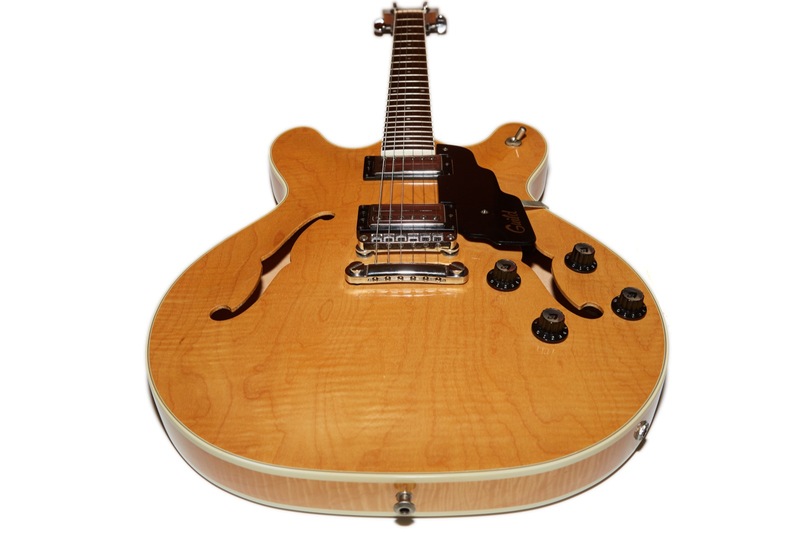 While many people prefer the harp tailpieces found on the 1970s Starfires, I generally prefer the stop-tail on a semi-hollow like the Starfire 4, probably because I grew up playing stop tails more than anything having to do with tone or string tension. 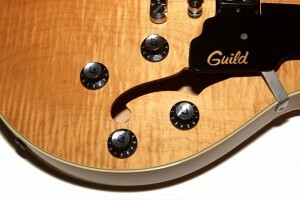 It’s a shame that Fender ended up discontinuing the Guild electrics because they really were amazing guitars. While the current Guild Newark Street guitars are very nice guitars, in my opinion they don’t hold a candle to these late ’90s to early ’00 era Guilds. 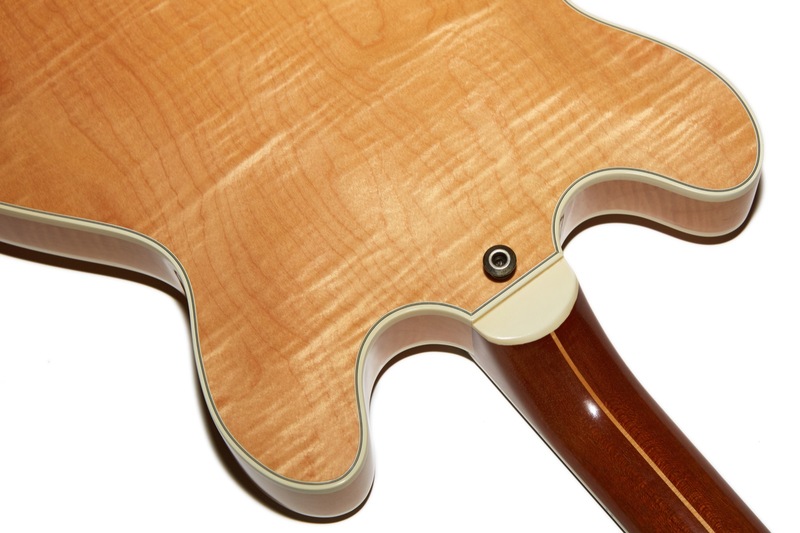 If you like wide necks with some girth, this guitar would probably be one of your favorites, too. From a playability standpoint I’d say that the only guitars I hav that are in the same ballpark are my Guild Nightbirds and my 2002 Starfire III-90. Perhaps not surprisingly, those guitars all have wide beefy necks. Aside from the Fender HB1 pickups that came in the guitar from the factory, this is one of the best playing semi-hollows I’ve ever come across. 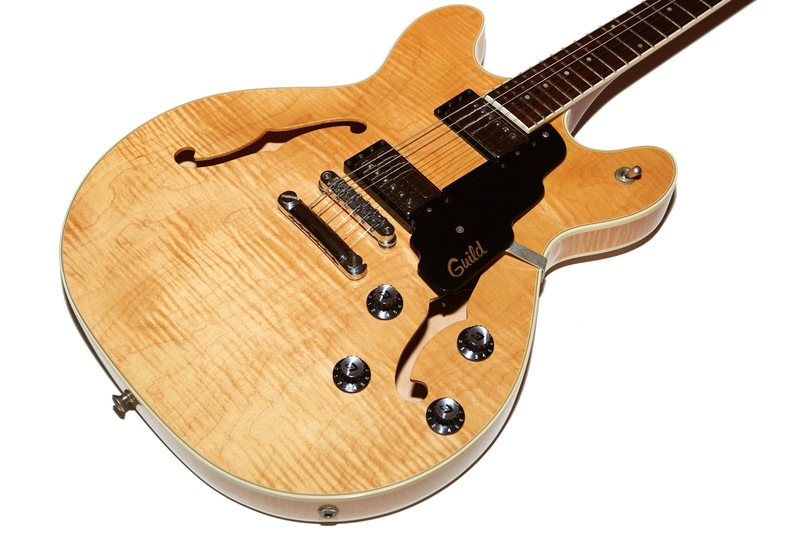 The only similar guitars I’ve played that I would have considered to be even close were the Collings I-35 or the Yamaha SA2200. 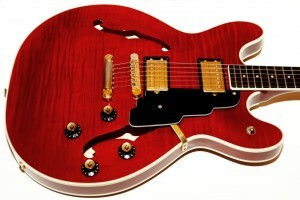 The Collings is damn near $5000 new and that’s not even a deluxe! Sure, it’s a hand-made boutique instrument, but from a playability and tone standpoint I’d put my Guild Starfire IV up against one any day. The Yamaha SA2200 is a great guitar that’s probably more inline with the price of a Starfire IV and comes with some nicer appointments like block inlays and an ebony fretboard. The problem with SA2200s is that I rarely see them in the wild. The other thing about them is that one of their strong points is also one of their weak points and that is the fact that they are so consistent that they all look exactly the same to me. They also look too much like a Gibson. I’ll stick with my Guild. I find it amusing that the first Guild I bought when I started down the path of owning so many is the one that I’ve kept the longest. Perhaps I should have just kept this one and played it more without buying all those others, but then I would have been able to write all these cool articles! My advice on this era of Starfire IVs is this: If you find one, buy it. They’re one of the best Guild electrics out there and there are plenty examples of people producing stellar music and tones with the stock pickups. 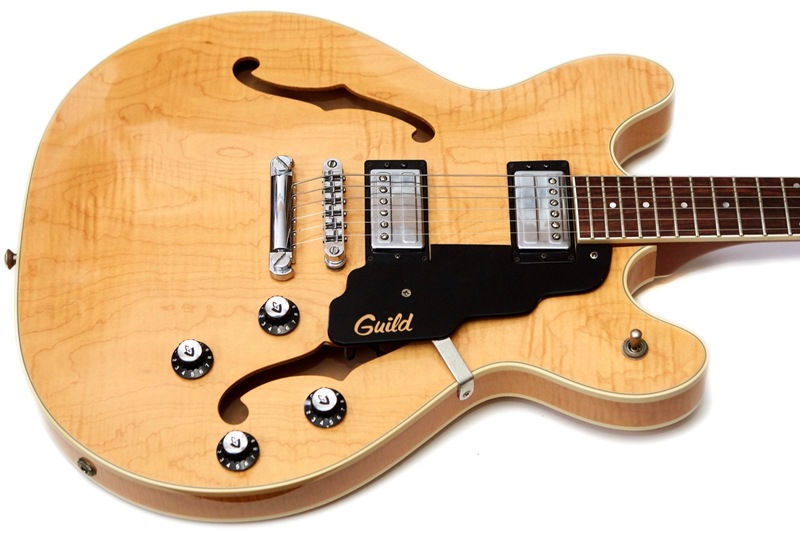 3/2/17: I have the option to buy a Guild Starfire IV with natural blonde finish with less than 12 hours playing time, a virtually unused instrument in excellent condition. It comes with the original Guild case and owner’s manual. This Guild is one of the last from the Westerly, Rhode Island plant late 2000 or early 2001. The seller will accept $1200. Do you think this sounds like a good deal? Do you know which pickups this is likely to have? Thanks. If there’s a way, I could post a picture. I have a Guild Starfire 4, purchased new. Serial # AG001173. Can you tell me the year it was made? I also have 3 other Guild acoustics, all purchased new in 1966, 1980 and 2013. Great guitars. I felt like I was reading my own autobiography for a minute there! I’ve owned quite a few Guilds and unlike you, I let them all slip away for either financial reasons or to acquire the next holy grail guitar that I just had to have. I’ve owned (in the course of 44 years) 6 different SFIV’s, a SFII, a SFIII, Manhattan, Savoy, Park Avenue, and a Bluesbird. Not bragging, just attempting to convey how much I loved Guilds (and I forgot to mention the D-25, D-35, D-40, and Songbird!). That I have long been a ‘bedroom guitarist’ who dreamed of becoming a ‘living room guitarist’ did not deter my GAS; (and that’s just the Guilds!). Anyway, my friend Jeff loaned me his ‘72~ Starfire IV back in ‘73 and I was hooked. It was the reddish mahogany version, inlays, master volume, harp-tailpiece – he still has it 46 years later. My 1st SFIV was a ‘74 identical to my friends; bought it while stationed in the Army in Colorado. I let it go for a handful of magic beans (ill-advised trade) and kick myself to this day. 4 years later, I acquired another ‘74 Blonde in the same configuration. 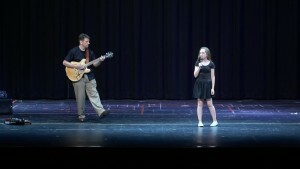 Somehow that guitar, and my grandfather’s Gibson L-00 and that Guild got me through the next 20 years. After a divorce in 2001, I discovered Elderly Instruments, Guitar Center, and e-bay and in short order I was the owner of an INSANE number of guitars. I’ll spare the details but a good portion of what should have been kid’s college funds and retirement savings went into a deep dark GAS pit. I’m now in my mid-60’s and somehow surviving with ‘only’ a handful of guitars – Tele, Strat, LP, Taylor and Córdoba – but no Guild 🙁 The era I’m most interested in – Mid-70’s – run northwards of $2k in good condition and now that I’m retired, and re-married, another SFIV is not in the cards. I’ve owned a number of stop-tail IV’s and they played and sounded great, but the funny thing about the harp tailpiece – when I was young I thought they looked kind of hokey, but now I think they look classic. I emailed Guild (Córdoba) to see if I could order a modern day import SFV but ‘hold the Bigsby, add the harp’ and they said flat out ‘No’, so I won’t be able to replicate the look without breaking down and saving my nickels for a Westerly era mid-70’s model. The harp, inlays and master volume were so integral to my first experience with the guitar that I’m too bull-headed to compromise I guess. Anyway, nice reading your commentary on the fabulous SFIV(4)! Thanks for sharing your story! I’ve owned a couple of ’70s Starfire IVs with harps. The brown mahogany had probably the best tone I’ve ever pulled from a guitar but the neck was so tiny I just couldn’t bond with it. I do like the looks of them, but there’s just something about the stop tail that works better for me. Now on the larger jazz boxes, the harp is a must. I guess I’m just complicated. If you’d like to see some thicker Guilds with harps, scroll through my other reviews at http://gadsguilds.com. I’ve also got some others in the queue, so stay tuned!